Let’s take a peek at Hello Neighbor, an original indie stealth game by Dynamic Pixels. Does this unassuming game have a chance to take the players by surprise and totally outmaneuver their human intelligence? A small team, a small budget, a small publisher – and a great idea. Dynamic Pixels decided to build Hello Neighbor, an indie stealth horror game, upon these foundations. The goal: to not only deliver a game that’s original and solid, but also present a fresh approach to artificial intelligence in video games to the modern player. Cast as the revolutionary AI: an ominous neighbor living across the street. In his spare time, he enjoys learning from the mistakes of others, watching Brazilian soap operas, and – most probably – experimenting on humans. We were able to infiltrate his home thanks to the game’s early alpha. Below, you’ll find everything that you should know about this shady individual. 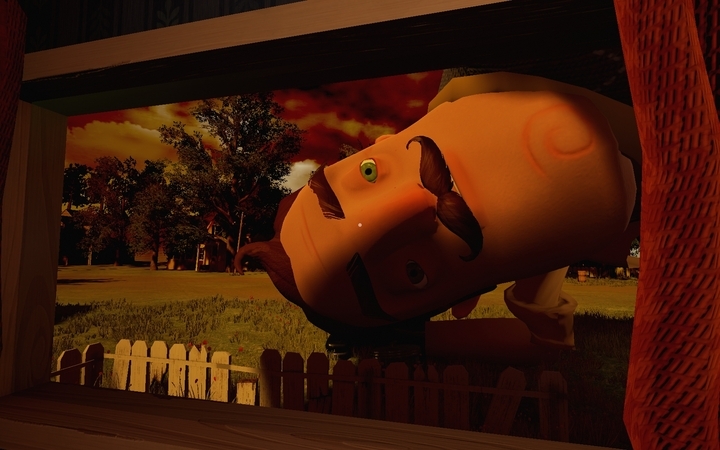 The innovativeness of the AI in Hello Neighbor actually consists in its ability to remember the route the player took during their previous approach to break into the house, and to create a number of cleverly designed obstacles within this path. This is supposed to force the player to look for more creative ways after being busted. At the same time, it is also the game’s battle cry, underlining the (at least partial) revolution that Hello Neighbor brings. In practice, however, this feature is not all that impressive – at least currently – mainly because the AI’s tactics are surprisingly easy to foresee. If the player begins the infiltration at the front door a couple of times, it will sure be closed later. The city may be deep in slumber, but the malice on the other side of the fence is wide awake. Repeating the same strategy all over again will prompt the neighbor to personally guard the entrance, or to secure the front porch with a set of loud traps. If you spend the next couple of turns persistently trying out another path, a ton of clever hindrances will appear there, which will make it far more likely to get caught. At the end of the day, the solution is to juggle different approaches in order to trick the neighbor, find a gap in his plan, turn the obstacles into an advantage, and uncover the grisly mysteries of the basement. So if the developers want the AI to be truly groundbreaking, they face a difficult task of teaching it to use the available stumbling blocks in such a way that an impression is created of the AI really predicting the player’s movements and turning the house into a real maze, where each careless step can lead to failure. This principle may sound rather simple but the task is in fact incredibly difficult, since the number of variables (multiplied by each new trap) the AI would have to consider in order to accurately simulate the mental process of planning, requires an amount of work that may exceed the studio’s capacity. This probably is the reason why – so far – the neighbor has only a few available routines designed to surprise the player. One way or another, the devs don’t have much of a choice – the AI has to be seriously improved to live up to the hype. It’s not a leisurely morning jog – it’s running from a potential psycho killer. The idea of neighborly hate has already been used as the theme of a video game by an Austrian team, JoWood. In 2003, they published a game called Neighbours from Hell. The player’s task was to get under their neighbor’s skin – in the most spectacular way possible. Each level – stylized as another episode of a TV show – ended with the evaluation of the player’s performance by the audience. The game met with warm reception, and was followed by a sequel – Neighbours from Hell 2 – just a year later. The neighbor’s methods of hindering our infiltration aren’t very diverse but they sure are pretty sophisticated. Locking door is hardly worth mentioning, but bear traps lying here and there are quite a different thing (and pretty effective, too – especially at night); still, they soon turn out to be a trifle when compared to the rest of the solutions. Boarding up windows, barricading corridors with piles of furniture, placing cameras in critical spots or, completely redesigning the house, including a change of the rooms’ layout. 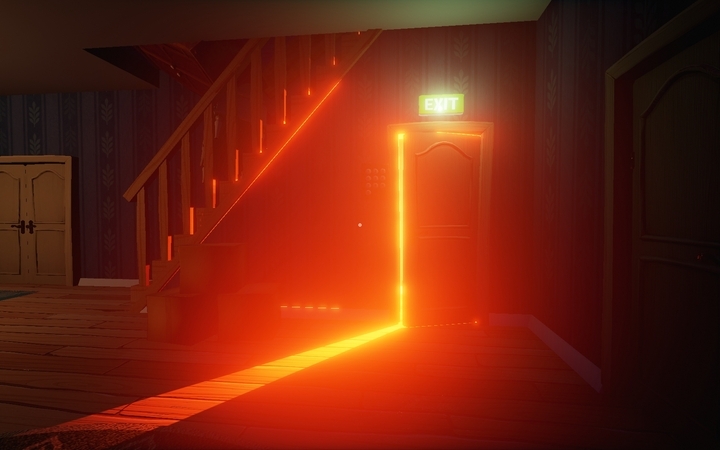 Future updates will bring even more of these, as well as unlock the rest of the house (only the ground floor is available so far). The end product will not only offer incredible diversity, but also a chance for a couple of hours of solid brain racking. Obviously, since there’s a remedy for everything, our hero is not left barehanded and takes these obstacles head-on – provided that he or she has the right tools. 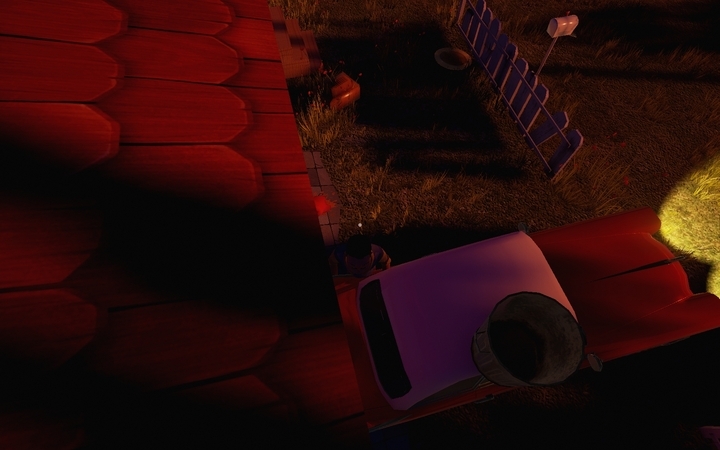 Hello Neighbor features a mini-inventory (four slots) that enables “counter-interaction”: pull out boards with a crowbar, unlock doors with a key or block it with a chair. On top of that, there’s some equipment facilitating orientation, such as binoculars or a flashlight; however, these two don’t come in extremely handy in the current version of the game. In case you get exposed, you can keep all your tools – if only you manage to barricade yourself with them in your own flat. Squirreling the tools away saves the trouble of finding them during successive attempts, since with every playthrough they might turn out to be in a completely different place and much harder to reach. Being compromised doesn’t leave you with many alternatives – either you run to your bed in your room in your own house, or you get caught. At present, the difference between these two is nonexistent – in both cases you just start over again with new obstacles aptly added by the AI. 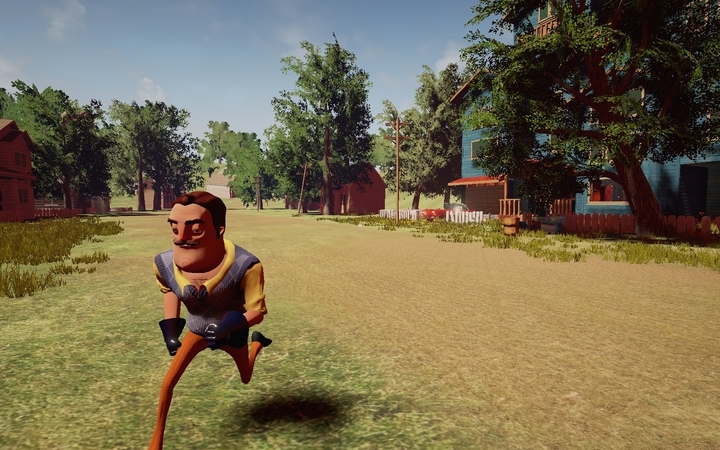 In the future, however (as indicated by some fragments of gameplay), Hello Neighbor may be enriched with story elements, such as the theme of the main character’s insanity. Although he looks like quite an egghead, the neighbor doesn’t really know how to use the environment to his advantage. Sneaking itself is not too complex. Apart from typical stealth mechanics – walking silently or leaning out from cover – there are other methods of tricking the neighbor: he can be distracted with different baits (like turning the TV or radio on), while removing a light bulb will prevent him from turning the light. You can also throw a nice, ripe tomato at his window so that he can entertain the possibility of someone luring him out on purpose. Essentially, the most prominent feature of the game is the fact that the neighbor can outsmart you anytime; his reactions are never entirely predictable. Blending in is only one of the many skills our neighbor has. 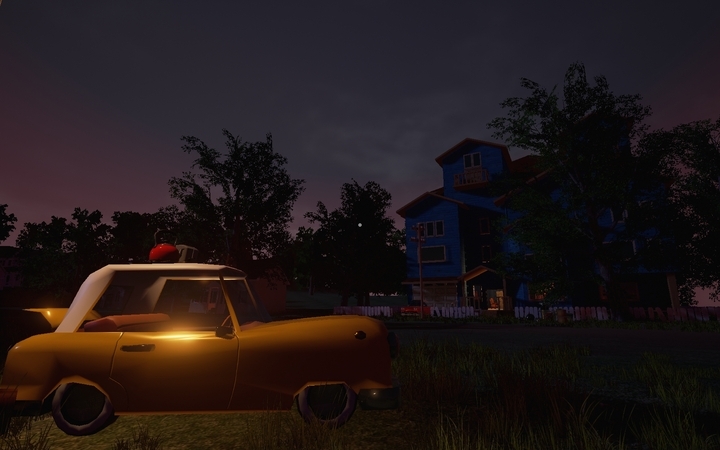 At the current stage of development of the game, the neighbor exhibits superhuman perception and impressive acrobatic skills. Sometimes his hypersensitivity leads to ludicrous situations. For example, it sometimes happens that the player doesn’t even get the chance to go to the other side of the street before the neighbor runs out and chases them back to their bed – just for kicks. Then there’s his persecutory delusions, compelling him to do things that are inexplicable to say the least, such as getting out of his house through a window… which he’s just “opened” by tossing a chair through it. These shortcomings can unfortunately impair the gameplay’s coherence – the baits sometimes produce no result at all (even if they’re used for the first time), hiding in the wardrobe is becomes a futile and naive attempt when confronted with our neighbor’s Witcher-like senses; even fleeing to the roof doesn’t always save you from his reach. It’s true that the game’s still in pre-alpha, but neglecting technical aspects has never worked in any game’s advantage. 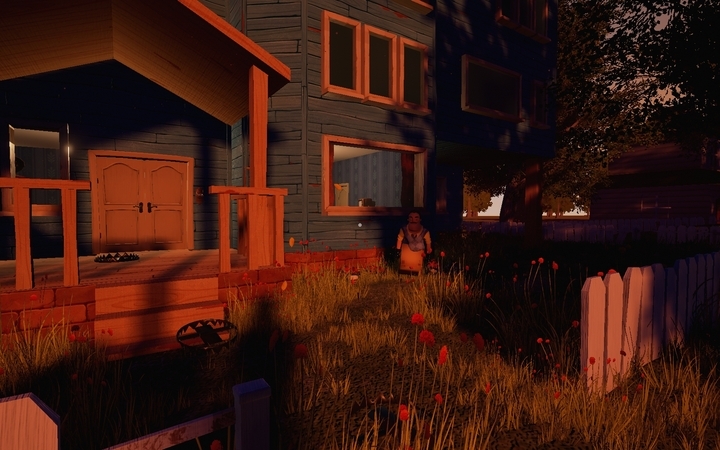 Hello Neighbor is undoubtedly an experiment, and its future can go at least two ways – nevertheless, the game surely has a certain charm. The loudly advertised breakthrough in artificial intelligence is probably not going to happen, but the fans of puzzle/stealth games should squeeze at least a couple of hours of quality fun out of it. The difficulty level rises with each approach, and playing cat and mouse is believably prolonged by the options the game offers. Whether or not at least a small revolution is coming, we’ll find out some time in the summer of 2017. What gruesome mystery lies behind the door? Northgard hands-on – Did The Settlers finally find their heir?